It does more than any board portal, ever. 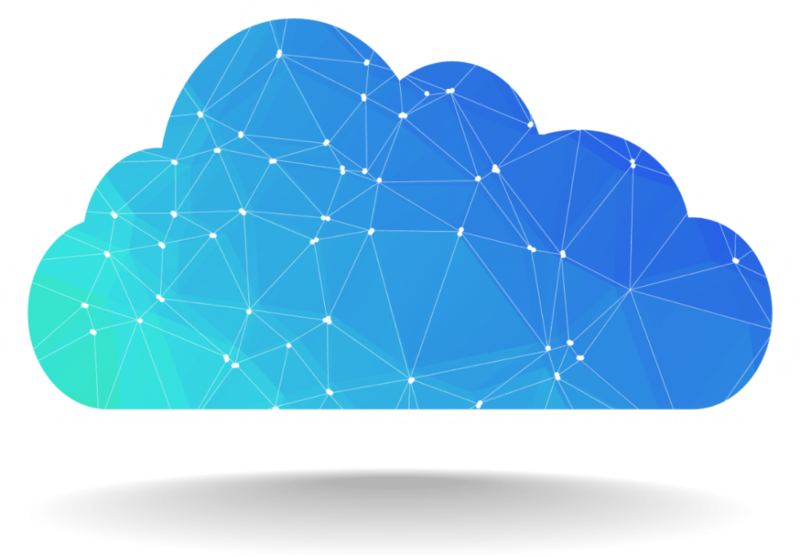 OnBoard was engineered to deliver performance, security, and simplicity through the Cloud. That means it works from any browser, backed by industry leading Azure Security, and auto-saves your interactions so you never lose your work. 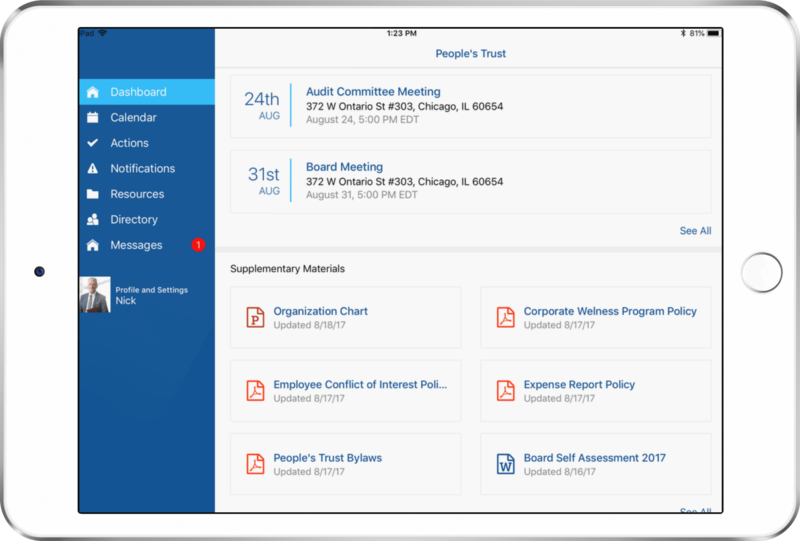 Board schedules vary, and the last thing you need is to show up to a meeting and discover everyone needs to update their OnBoard app. That’s why OnBoard gives each organization control over when to deploy the latest OnBoard releases to their directors and staff. Your board materials security is absolutely paramount. That’s why OnBoard works with Face ID and Touch ID technologies on Apple devices to authenticate users before they enter OnBoard. Better yet, you’ll never worry about forgetting your password. OnBoard boasts integrations with the apps you love and use every day. It integrates with Outlook to keep your calendars aligned, it works seamlessly with Word when drafting minutes, and streamlines book building with One Drive, Google Drive, and Dropbox Integrations. We were the first to market with a dedicated iPhone app. We didn’t stop there. OnBoard runs flawlessly across PCs, phones, and tablets; with dedicated apps for iPhone, iPad, Android, Windows, and Amazon Fire. OnBoard’s next gen cloud architecture is engineered to enable everyone to work together to create, distribute, and review board materials. An administrator in Chicago and a CFO in New York can update the board book simultaneously. Never having to press save. It’s like using Google Docs or Office 365 – you will never lose your work. It’s the best way to “co-author” without going through the version nightmares of older board portals. 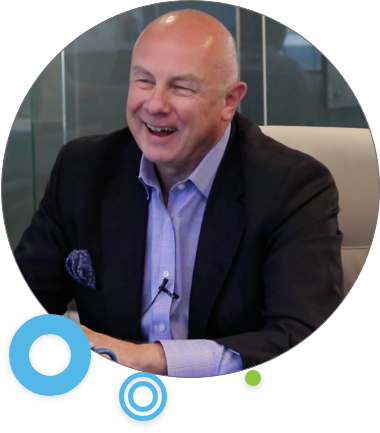 Our Next Generation Annotations too enables directors and leaders to simply start a conversation about any aspect of their board books. The ability to share these next gen notes are all part of a greater whole when it comes to creating a more collaborative experience. What makes our Shared Annotations so advanced is the type of content that can be shared. In older board portals, only typed notes were sharable; OnBoard is the only board portal that lets users share all types of annotations, digital notes, free-hand notes, and highlights. Next Gen annotations include advanced styling, complete searchability of all annotation types, and an easy way to see who you are sharing annotations with. 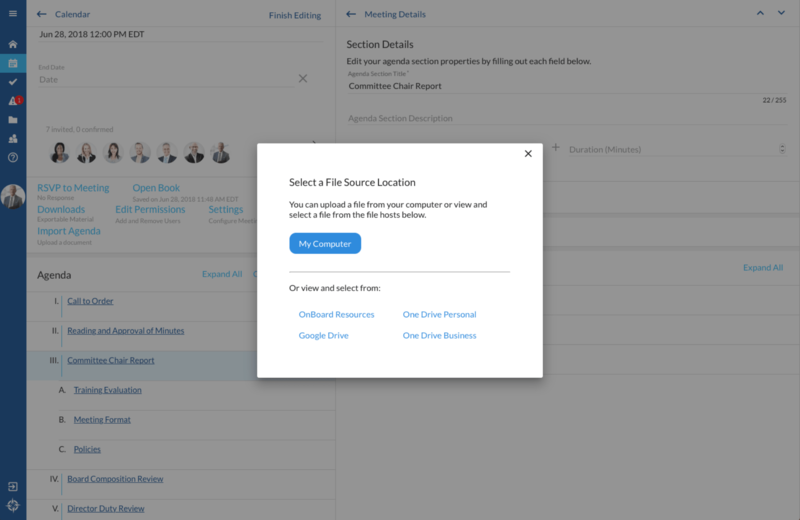 OnBoard’s Next Gen Integrations connects your board portal to a variety of cloud applications you already use and love. OnBoard connects seamlessly to Google Drive, One Drive, DropBox, Outlook, Word, and more. It’s vital that your board portal just works, and that means connecting to the solutions you already use. It means that you won’t spend hours learning a new platform or migrating all your data. If you use it to get work done, it will connect with OnBoard. 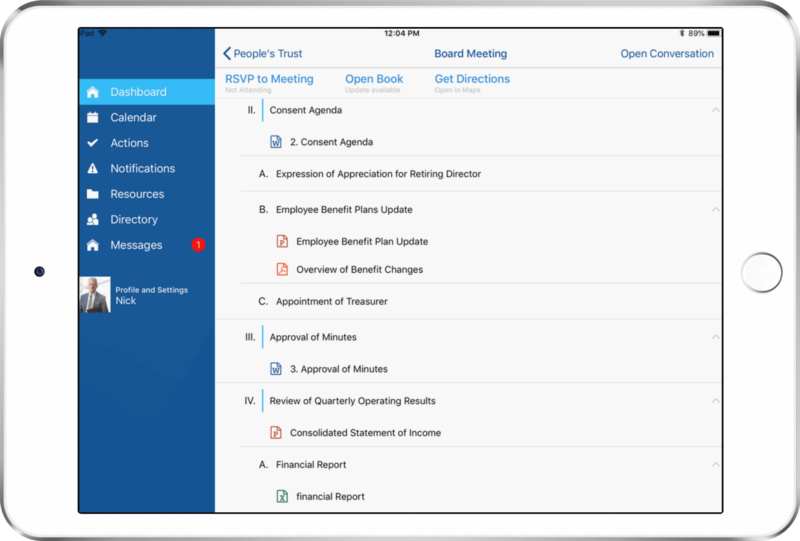 OnBoard’s Next Gen Book Builder empowers administrators and executive assistants to easily create a dynamic agenda and board book. Working on their iPad, PC, or Desktop, administrators have powerful cloning tools to use a previous agenda as a new canvas. Even more powerfully, OnBoard can take a Word Document Agenda and transform it into a meeting outline. As administrators amend any section of the board book, their work is automatically saved across the platform. OnBoard is the only board portal on the market engineered to automatically save as your work, designed for multiple authors to work simultaneously. These tools ensure that the board is never waiting on the entire board book; administrators can partially publish what is ready when it’s ready. OnBoard is purpose built for mobile. It’s next generation design makes meeting more than operational presentations, it turns them into strategic working sessions. With clear design, meetings become more productive, board book access becomes amazingly intuitive, archives are readily accessible, votes can easily be taken, minutes entered, all so you have time to devote to thoughtful deliberations. Time savings—the result of improved collaboration before and during a meeting—is the single most important benefit an intuitive, next generation, platform can provide your board. A flat and simple design makes navagating the board book amazingly easy. 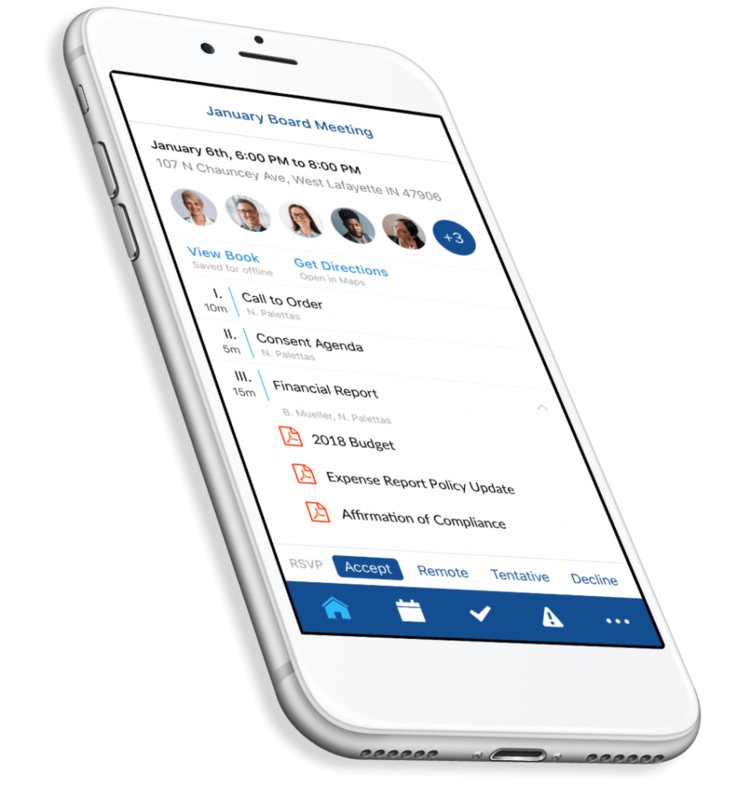 A quick tap to the agenda reveals every supporting document to a section, giving you instant access without digging through 100s of pages. Every member of the board or committee meeting is highlighted above the agenda. Tap their portrait to reveal their profile and full contact information. Your organizations resource library will securely contain every significant document you need to effectively govern. OnBoard is the most accessable board portal ever, designed for everyone. Multiple people can collaborate together when the agenda is being created. The board book builds and updates in real-time. Never lose your work. Never over ride a previous version. The Dashboard is the personalized homepage for every organization. Quickly examinine upcoming meetings, instant one-touch access to supplementary materials and announcements. Whenever an OnBoard release is implemented, administrators are offered the option to immediately deploy the release across the entire organization or simply schedule for a later date. 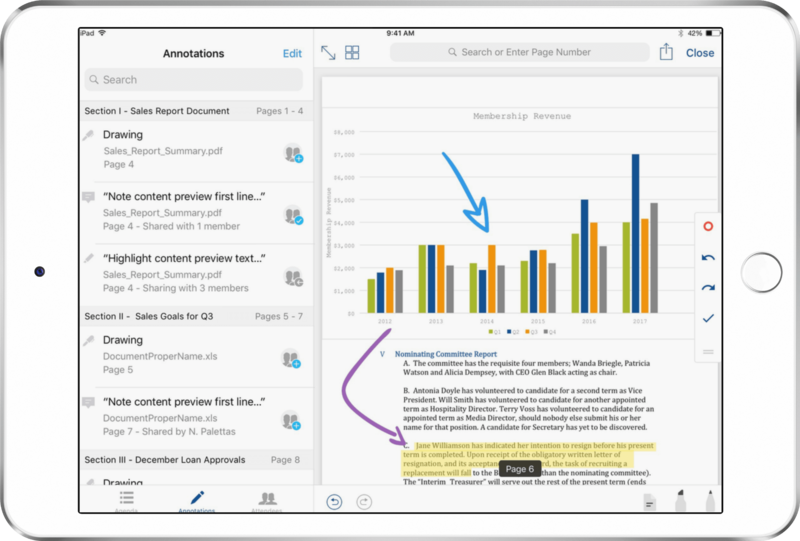 Your notes and annotations automatically sync between every device. Take a note on your iPhone and it will be immediately available on every other device. Your board materials security is absolutely paramount. That’s why OnBoard works with Face ID and Touch ID on Apple devices to authenticate users before they enter OnBoard. eSignatures provide a fast, secure, and accurate identification alternative for signatures, all while keeping your records compliant. No matter what device you love, it works with OnBoard. You can create a board book on your Macbook, send it to your CEO to review on his Android phone, and upload documents from your home PC. Approve the annual budget, amend the bylaws, adopt employee benefits, any board actions can be voted on directly within OnBoard.